Ferguson Enterprises of Newport News has pledged $75,000 to the Virginia Institute of Marine Science to support graduate student education and public outreach at the Gloucester Point campus. The gift was presented by Mr. David Meeker, Deputy General Counsel and Assistant Secretary of Ferguson and a member of the VIMS Advisory Council. The gift will be paid over five years, with $12,500 per year used to create an endowment to fund a permanent student fellowship in the College of William and Mary's School of Marine Science at VIMS, and the remaining $2,500 per year to support the Institute's annual Marine Science Day open house. Meeker says, "For all of us in Hampton Roads, stewardship of marine resources is vital. That’s why Ferguson is so pleased to support VIMS’ research and education mission through a student fellowship. VIMS students are key to research that helps identify and solve issues facing Chesapeake Bay, and they go on into careers where they will help improve the health of our environment both here in Virginia and around the country. We also recognize the importance of all ages learning about our natural world through events like Marine Science Day." VIMS Dean and Director John Wells says the gift "addresses one of our greatest student needs, which is fellowship support so that we can continue to draw the best and brightest to VIMS." Admission to the School of Marine Science at VIMS is highly competitive, with the most promising students also being courted by other leading marine science graduate programs around the nation. Professor Iris Anderson, Dean of Graduate Studies at VIMS, says "This gift will help us level the playing field by offering the possibility of merit-based financial support to prospective students." Funding to support the Ferguson Graduate Student Fellowship at VIMS will begin in autumn of the 2008-2009 academic year. Fellows will be chosen from the School of Marine Science at VIMS by the VIMS Academic Council based on academic performance and financial need. 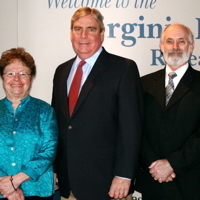 The Ferguson gift was made to the Virginia Institute of Marine Science Foundation, a nonprofit 501 (c) (3) organization that supports the education and research missions of VIMS. VIMS is an independent state agency with a mandate to provide research, education, and advisory service to the Commonwealth. The School of Marine Science at VIMS is a graduate school of the College of William and Mary.